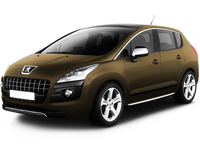 The Peugeot 3008 is a compact and spacious crossover. It represents a new and innovative offer, not only in the Peugeot range but also in today's car market as a whole. Manufactured in Eastern France at the Sochaux manufacturing plant, its concept and specification has draw on all of Peugeot's expertise and values. The Peugeot 3008 reviews are fairly impressive, it gets a good reception. It's a crossover, which is a cross between an SUV and a hatchback, so you get low running costs combined with the space and high-up driving position of an SUV.